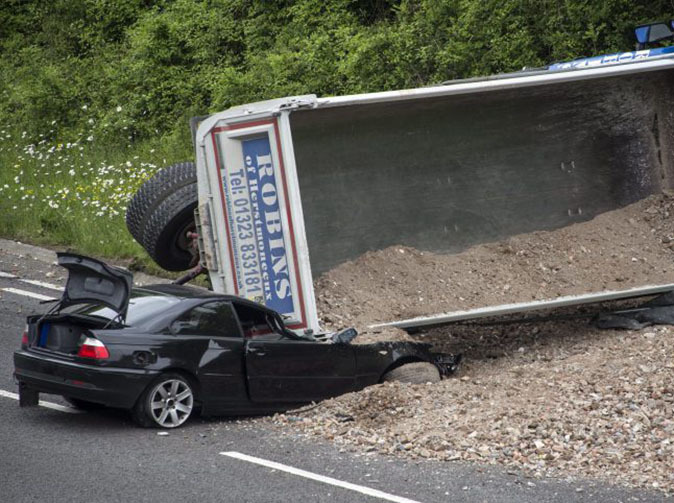 A BMW was almost completely crushed by a lorry but the driver miraculously escaped unharmed. Although the lorry fell on top of the front car, the BMW 320's driver only suffered a minor hand injury, and was otherwise completely unhurt. The Blue Scania Tipper was carrying rocks and aggregate when it overturned on the A23 at Pyecombe, West Sussex, at around 9am on Friday. It collided with the BMW and blocked the road. The southbound carriageway of the A23 was closed for three hours while police dealt with the incident. A crane was brought in to lift the lorry upright, and the road had to be examined for damage before it was reopened at midday. The 26-year-old BMW driver from Brighton was taken to the Royal Sussex County Hospital. The 45-year-old lorry driver from Bexhill, East Sussex, was also uninjured.